Suzannah Espie, Sarah Carroll and Gleny Rae weave a magic quilt of euphoric harmonies, cheeky reflections and a genuine celebration of roots music that’ll leave you grinning uncontrollably and swinging your hips. Frock-flicking instrument changes include fiddle, squeezebox, ukulele, guitar and mandolin, while Chris Tabone and Dougie Bull fuel the engine room with their solid swing, rockabilly, calypso and country grooves. The Junes have battled the tyranny of distance since they formed in 2005, with three members in Victoria and two in Newcastle NSW. 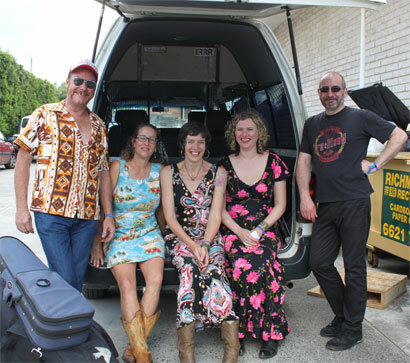 The band appeared on Spicks and Specks, performed at The Falls Festival, National Folk Festival, Bluewater Country MusicFestival, Port Fairy Folk Festival, Tamworth Country Music Festival and Brunswick Music Festival to name a few, always to a rapturous response. Their three part harmonies cast a spell on the audience, while the originality and humour of the three women’s songwriting illuminates the female perspective of country music. Suzannah Espie (Port Fairy Folk Festival artist of the year 2013) plays guitar and mandolin, and can blow back the listener’s hair with her powerful soul vocals. Sarah Carroll is the ukulele queen of the Bellarine and master of acoustic country guitar; her songwriting skills complement the depth of her contralto voice. Gleny Rae holds a deep love and fiesty mastery of the fiddle and squeezebox, and adds an experienced rural touch to the song list. All three ladies have established themselves as hardworking, creative and entertaining solo artists, but the combination of three powerful singer/songwriter/instrumentalists is way greater than the sum of the parts. The Junes’ latest release 'Country Con Queso' was recorded at the famous Adelphia Studio in Melbourne, and produced by Jeff Lang. It is a diverse journey through the quirky, quizzical and quixotic elements of Quontry Music... with a healthy dose of Junesian humour and Queso (that means cheese!) Guest artists include Jeff Lang, Garrett costigan, Rick Dempster, Andy Reid and Billy Abbott on washboard along with Newcastle’s hottest horn players Kim Pink, Shane Landry and Jason Nelson.